is no difference in the emptiness of your disappointed stare. Yes Jae ... that should have been in there as well... the silent dignity and grace of an old soul. Pearl, you bring this message home to roost - our failed collective, his bewildered innocence. Such a powerful poem, full of heart. This little one grips the collective conscience as did that other small soul lying on a beach last year. The madness has to stop. You write with great power. Thank you Sherry as with the toddler in the surf last year - I truly implore the Universe to never feel the pull or need to write another ... ever. If we could all stand up together...yes...that is the invincible dream. Pearl, this is a powerful poem, that underlines everything we feel when we look at this innocent, bewildered child, resigned to suffering. The phrase that brings it home is "our collective failed protectorate". And "our shame writ in the tousled bewildered innocence of blood".........Yes, we the shame and the solution..............This photo has sparked our consciences as did the photo of the small body lying on the shore last year........this must end. How do we live with this continual killing--it has to stop--this is such an evocative piece! I do not feel that I could or did do Omran justice - but yes, this continual killing has to stop...and if nothing else we need to raise our voices and condemn this brutality. Oh, Pearl, we were kind of inspired in the same way. 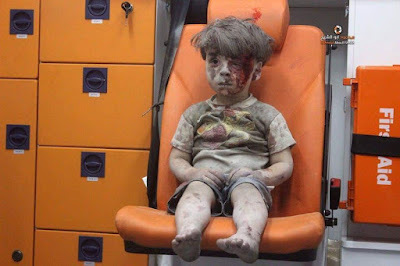 I didn't know if I could use Omran's photo, so did not. It is hard to know who is to blame, isn't it...whether 'we' or 'they' Omran's tragedy is the same. Thank you for this sensitive poem. Yes Mary, could not sleep without getting something down ... in some way to bear witness to the horror that must end. Well done... if "we' or "they" were to blame - you raise such an important point... we are all to blame for our silence. So true. He is lucky and hopefully he will recover from the trauma but we must always remember our governments consider this to be but collateral damage in the cause of victory. How sad it is that poets must fly the flag for the innocents of this world yet those we elect feel no shame. Alas. You have said it all. sleep secure- their unexploded world softly breathing ..."
If this child--or any of the new poster children of our destruction--can get us to feel, can get us to stand up, cn get us to place our bodies between them and horror .... if, then .... You push us to act in this moving epistle. Your poem is powerful, and carries weight that conveys such harrowing events, of which mankind is losing, or maybe lost control of; with the portrayal of his trauma, and our shame. A fine piece of writing. This is a poignant piece: moving words, for the boy who sat, silently (clearly traumatized) as the world looked on.